What? Really? We are going to compare this wonderful 60-70s style cafe racer with a brash modern day sport naked? Who thought this was a good idea? There we've said it. The question that all the Royal Enfield fans are going to ask. But this test is crucial because one of the first responses to our Duke vs CBR250 story was a request for this very comparison test. And because while you might think the result is a foregone conclusion - it isn't - there is a lot to learn about the nature of the Continental GT from this comparison. Stuff that defines why the Continental GT is actually a completely valid and more importantly, a radically different motorcycle purchase in nature from the KTM. Never in our history have two identically priced motorcycles offered such a wildly different experience. It begins, of course, with the styling. KTMs have always had this edgy, sharp-edged design that almost defines their look. To the point where you can paint them in any colour, including pink and you'll still recognise Kiska Design's work and link that back to the Austrian brand. On the other hand, the Royal Enfield is a product of its history, as befits the flagship from a company that owes a lot to its legacy and is inspired heavily by it. There are a million pitfalls and traps when you set out to design a motorcycle based on lines and shapes from history and Royal Enfield and Xenophya have successfully navigated this minefield to stunning result. The Royal Enfield Continental GT, to me, is the best looking motorcycle on sale in India right now. The nostalgic element is part of it but I love how restrained the design is and how much it benefits from it. The Royal Enfield Continental GT, to me, is the best looking motorcycle on sale in India right now. In comparison, the KTM looks thoroughly modern but somehow more shallow and less classy. Of course, functionally the designs are similar in their effectiveness and both have their own niggles. The ContiGT's riding position isn't as committed as it looks and it is more comfortable than you imagine. But it still places your knees closer than the feet and that's an awkward way to sit. And if you aren't hugging the tank  which relieves your knees  you won't be comfortable and end up carrying your weight on your arms and shoulders which will tire you out. The KTM, in contrast, is an aggressive street motorcycle but the ergonomics can feel odd until you get used to them. What you won't get used to is the hard seat, the lack of space to squirm around and on long rides, the pegs which are a bit extreme for hours at a stretch. But out on the highway, within the first hour or two itself you'll realise that the KTM is easier to stay in the saddle of, is less effort to ride than the Continental GT. the KTM looks thoroughly modern but somehow more shallow and less classy. This is not unexpected. Cafe racing was a matter of short sprints and for short sprints almost any bar-seat-peg position can be made to work. Part of this is also the nature of engine performance. 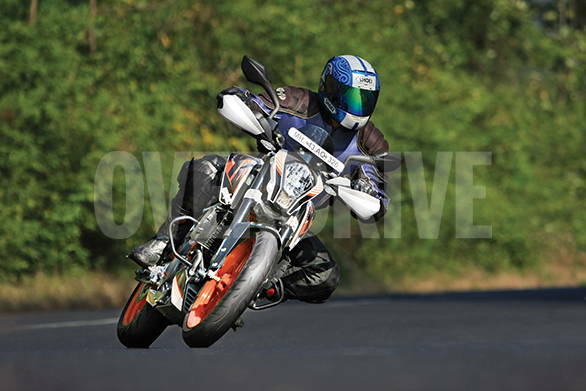 The 43.5PS KTM is way, way quicker and faster than the ContiGT despite the latter's significant displacement advantage. But more importantly, the KTM can be ridden at its redline without stress if the roads and laws were to permit a sustained 170kmph cruise. The Royal Enfield starts to vibrate quite seriously past about 3800rpm and running it to its 5,000rpm redline is just a very hard way to ride the bike. It'll leave you with numb hands. So where the KTM is happy to run at 120kmph all day, the ContiGT does the same at a much more sedate 90-105kmph. To put numbers to the difference in performance, the KTM takes 2.7 seconds to 60kmph, the Enfield, 4.3. 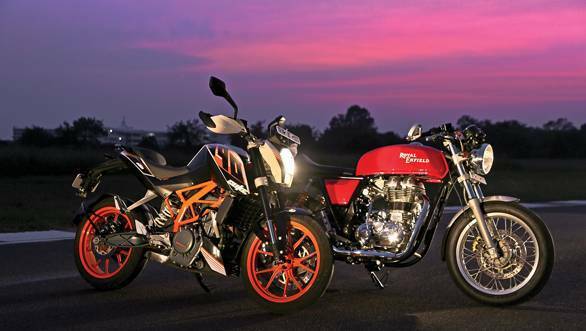 5.6s brings up the 100kmph mark on the KTM, the Royal Enfield takes just over twice as long at 12.01 seconds. The KTM, again is just under 40kmph faster flat out. On overall economy, both return 28kmpl. On the street, the Continental GT is a revelation compared to the other Enfields. It tucks into gaps with a precision unknown to the other Enfields and you can negotiate traffic very quickly knowing that the chassis will respond, the brakes will work and the torque from the big single is unfailing. But the KTM is a master at this. Sit anywhere above 5-6,000rpm and the torque is unbelievable. It's so fast that you cannot use the full performance and it makes the GT feel much slower to respond and accelerate. Ride quality is the perhaps the weakest link on both bikes. The KTM feels rock hard and isn't above jittering about on bad roads, a skilled rider can mitigate the shocks quite a bit by keeping the throttle gently open though. The Continental GT absorbs the road a lot more than the KTM, but it feels leadfooted in comparison and you have no choice but to slow down and wait it out. 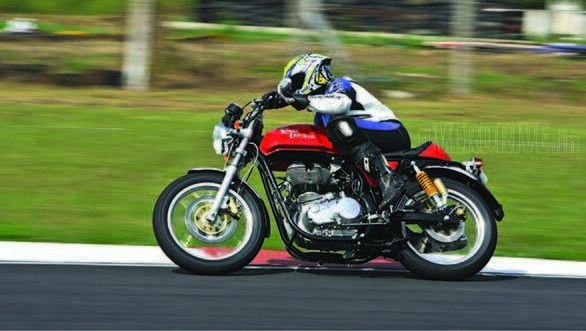 On the brakes, the Continental GT once again is Royal Enfield's top motorcycle. But the lighter KTM has the better brakes, the better chassis and ABS as standard which means the best, quickest, fastest, surest stops always come on the Duke rather than the GT. Handling is the area where the KTM absolutely blows the GT into the weeds. At the racetrack as well as on twisty roads, the KTM chassis is so quick to change direction and has so much power on tap that it makes the GT feel very slow to respond by comparison. The GT is more stable mid-corner but the KTM isn't unstable enough for this to become an advantage for the Enfield to exploit. If we had two Sarath Kumars who were both out riding these two at a track, the KTM would substantially disappear on the Continental GT within a corner or two. The upshot, beyond the shadow of a doubt, is that the KTM is a vastly better motorcycle than the Continental GT. And this is where a deeper understanding of the Royal Enfield is required. If you are looking for a fast, sporty motorcycle, despite its cafe racer looks, the Continental GT is not for you. If you go looking for a cafe, you'll find your KTM-mounted friend already halfway through his coffee by the time you park your ContiGT. If you are, on the other hand, looking for a fast, sporty Royal Enfield, you currently have no other option. On the other hand, the KTM can come across as lacking a bit of soul. It's fast, fun and sharp but the smiles it provokes are your reaction to its amazing power and its amazing chassis response. You get out on it, you push the envelope and you come back smiling. The Royal Enfield proposition is radically different. It says there are other ways to provoke smiles. Other ways to keep you interested. That you don't need to be the most powerful or best handling motorcycle to be awesome. That is the key to understanding whether you should buy a Continental GT or not. To me, you buy a Continental GT for short rides that are great fun at a middling pace rather than at the redline or for rides that last the full day. It has enough handling ability to tackle any road you throw at it, but competition with other motorcycles is not the agenda, riding with them and enjoying that sensation is. 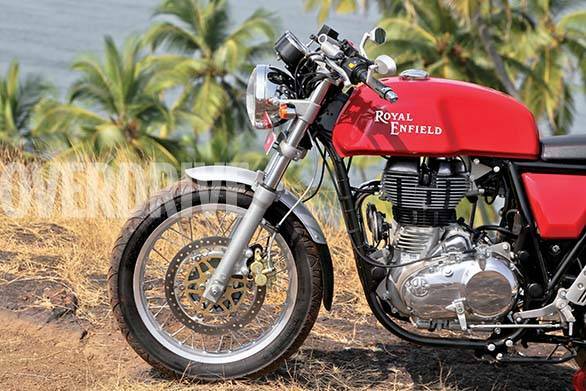 The Continental GT is Royal Enfield's best and far from perfect. But it tickles the emotional side of the rider like nothing else on the market right now. And that, my friends, is the reason to buy it. There are, of course, people who want the latest and the greatest. People looking for sticky tyres and the loud exhausts. These riders who won't enjoy the Continental GT. It comes to us today as a bike made in the current year but its heart beats to a different rhythm. A slower, unhurried rhythm that says its okay to enjoy the ride. That slower rides last longer and therefore are fun for longer. So are we really going to compare the latest and greatest to a gentler 70s style cafe racers? Why yes, we will. But this comparison test has no winners. It is supposed to make you take sides. I'm still brash, still looking for great engine performance and the ultimate handling. So the KTM excites me more than the Continental GT. But Royal Enfield says, and quite persuasively, that others, maybe you, don't want to be in the rat race. And for people like that, the Continental GT might just be all the motorcycle they'll ever need.